Sharkpunk 2 Comes To Kickstarter! 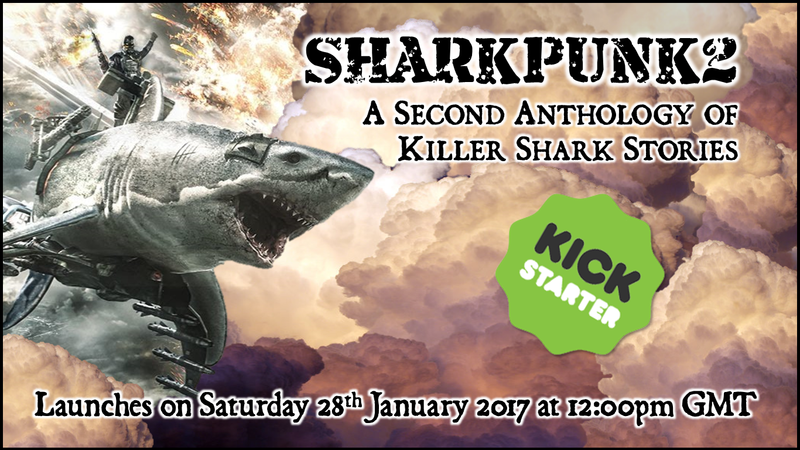 SHARKPUNK 2 is the sequel to 2015’s SHARKPUNK, an anthology of killer shark stories by a host of genre talent, and published by Snowbooks. SHARKPUNK 2 features brand new SF, F and WTF? stories from the likes of James Lovegrove, Gavin Smith, Gav Thorpe, Guy Haley, Michael Carroll, Jonathan Oliver, and many more. The inspiration behind the original SHARKPUNK was such classic shark movies as Jaws, Deep Blue Sea and The Reef – as well as such B-movie delights as Sharknado, Sharktopus and Mega Shark vs Giant Octopus – and SHARKPUNK 2 contains more of the same. SHARKPUNK 2 will also feature a brand new, original Sky Sharks story, set within the same universe as the forthcoming movie, directed by Marc Fehse, which was also funded via Kickstarter. The book’s editor is Jonathan Green, who is most well known as an author of adventure gamebooks and steampunk novels, and whose previous anthologies – SHARKPUNK, GAME OVER and Shakespeare Vs Cthulhu – have won both critical and popular acclaim. The Kickstarter to fund production of SHARKPUNK 2 launches on Saturday 28 th January 2017 at 12:00pm GMT (7:00am in New York, 11:00pm in Melbourne) and features a number of exclusives rewards. Included among these are signed Sky Sharks postcards, signed books, and the chance to have your name appear in print. There are also a number of reduced price rewards which will only be available during the Kickstarter’s first week, to encourage early backing. Next PostNext A Few Thoughts On Peter Capaldi Leaving Doctor Who.